Unfortunately, the requirements of Discourse for RAM is quite high, and you cannot just install it inside a shared hosting environment, because it is recommended to be run inside a docker container. It uses technology that I just don’t know very much, with Ruby on Rails and Redis etc. Then I discovered Flarum, which is written in PHP, but looks as nice and feels as modern as Discourse. It does not have exotic requirements, it just works. It is helpful to have an SSH account, to install the dependencies with composer, but that is available at Hostsharing for my shared hosting anyway. Flarum is still work in progress, and officially in Beta testing. But you can run your forums in production with the latest Beta already, if you know what you are doing. 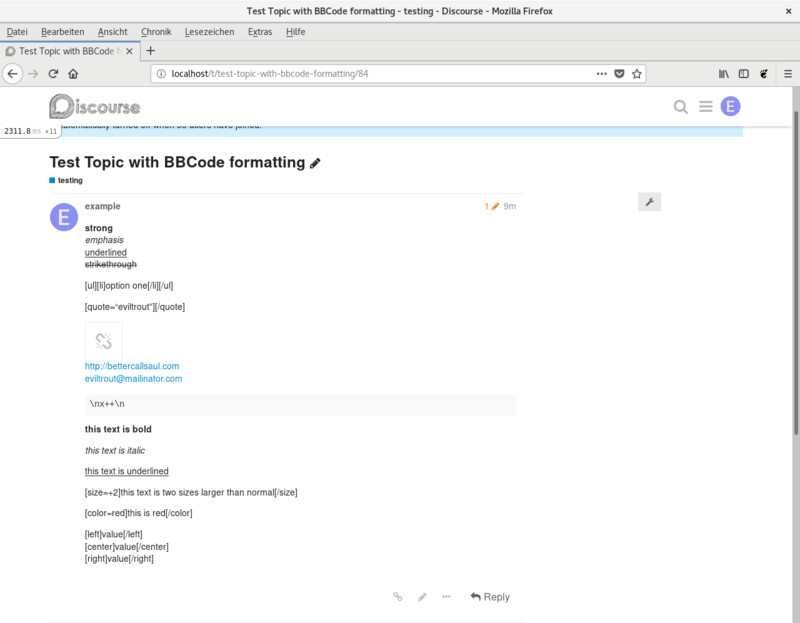 So now the issue is, how to migrate your forum from Discourse to Flarum. At TBits.net, we worked on a migration tool, based on the scripts https://github.com/robrotheram/phpbb_to_flarum, https://github.com/viruxe/phpbb_to_flarum, and https://github.com/Reflic/phpbb_to_flarum. We did not cover all aspects, but only those issues we needed for our OpenPetra forum. 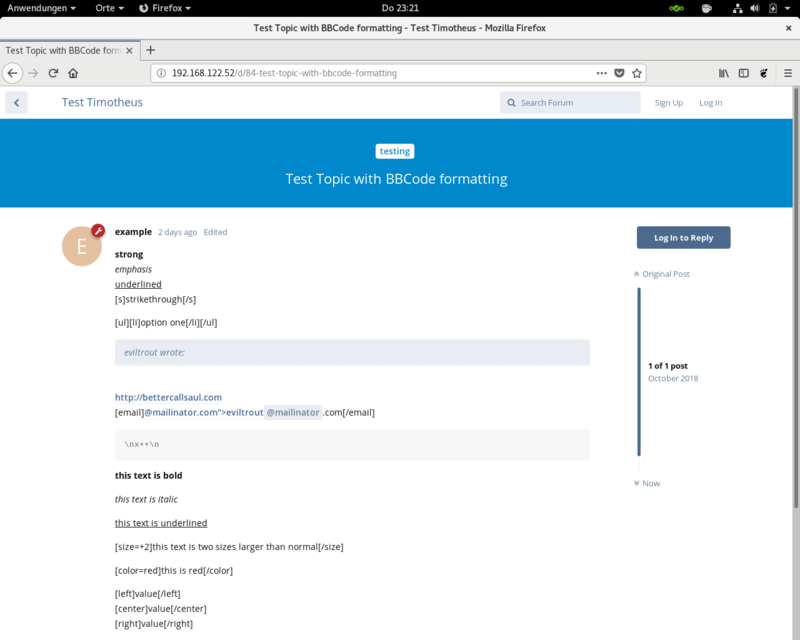 Format text properly, code, lists, http links, etc. So this blog post has the goal to make our script public, and to encourage you to use it and improve it! Pull Requests are welcome, or just fork it and use it as you like! Of course, in your real life scenario, you will have a database already. But for contributing to this script, we might need a test database, for reproducing specific situations. 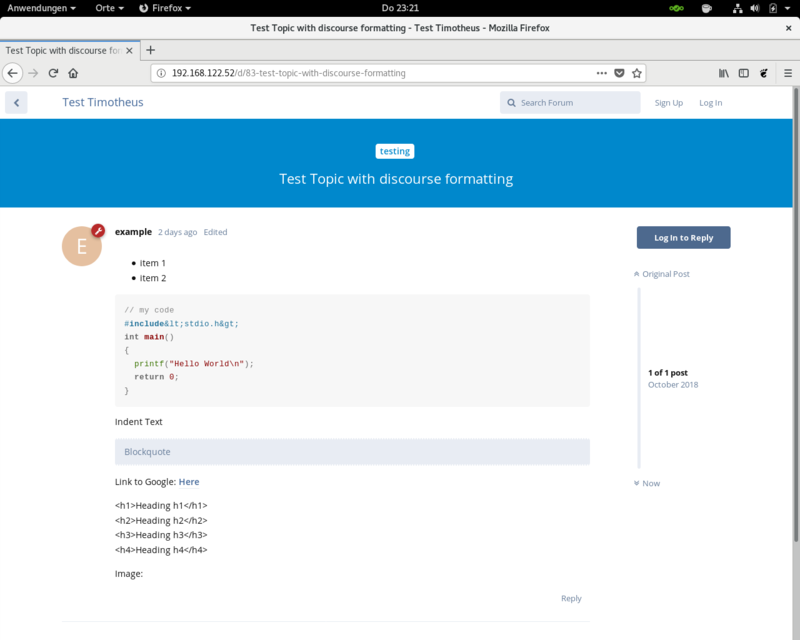 See my other post for details how to create a test database with dummy data for Discourse! Setting up Flarum is quite easy if you can access your webspace with SSH and you can run Composer. See the german instructions how to install Flarum inside your Hostsharing account. For running the script discourse_to_flarum.php, you also need a PostgreSQL database inside that container. This Ansible playbook will setup PostgreSQL, and will load the Discourse Backup into the PostgreSQL database. It will also install pgadmin and phpMyAdmin, which helps with debugging of the conversion routines. After this, you can access phpMyAdmin on the url http://192.168.122.52/phpMyAdmin/, the user is flarum and the password is flarum. 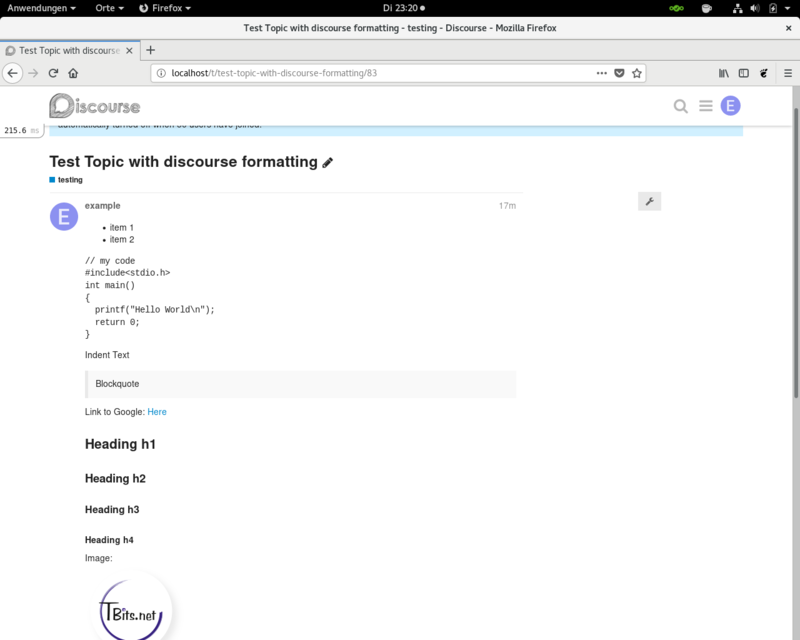 You can access phpPgAdmin on the url http://192.168.122.52/phpPgAdmin/, the user is discourse, and the password is discourse. And on http://192.168.122.52/, your Flarum forum is running. So there is probably still quite some work to do. Pull requests are welcome! At TBits.net, we have decided to use Ansible for setting up our servers. The most documented way of installing something on a machine via Ansible is using sudo: you create a normal user (eg. called deploy), that you can use with SSH to login to the machine, and if that user has sudo permissions (eg. part of the group wheel in CentOS), then you can install software with root privileges. Now we wanted to limit access only to users who have the actual password for root. Now, I wanted to specify these parameters in my ansible.cfg file. It took me a while to find out how to do this. I found https://github.com/ansible/ansible/blob/devel/lib/ansible/config/base.yml which was helpful. You need to specify the become settings in section privilege_escalation, not just in defaults. The command line parameter ask-become-pass becomes become_ask_pass in the config file. This works with Ansible 2.3.2 on CentOS 7.4. I noticed that because Epel already has version 1.1.3, but Kolab 3.4 Updates still has 1.1.2. Now there is an installation conflict, because yum wants to use the epel version, but that leads to other conflicts. The proper solution is to upgrade the roundcubemail package for Kolab 3.4 Updates on OBS. The new updated package will hopefully arrive in Kolab 3.4 Updates within the next days. Recently at TBits.net, we wanted to even better secure the authentication to a web application that we provide to our customers. We decided for partial passwords: You have your username and your first password, you login with that, and if that worked, you are asked about some specific letters from your second password: Please give us the third and 5th character of your second password! See this paper called “Give Me Letters 2, 3 and 6!”: Partial Password Implementations & Attacks that describes Partial Password implementations and attacks in a detailed study. The next question is, how to store the information about the partial password: you cannot hash it, because you will have to verify single characters. The solution is to use a secret sharing scheme, as described in Partial Passwords – How. It uses the Shamir’s Secret Sharing algorithm. I have now implemented this idea, processing partial passwords with Shamir’s secret sharing scheme, in PHP. You can find the code licensed under the MIT at: https://github.com/TBits/partialPasswordShamirsSecret. There is an example included. The Wikipedia article on Lagrange polynomial has been helpful as well in properly implementing the algorithm in PHP.